Whatever topic you wish to cover in your plant growth studies, you’ll find an all-inclusive lab activity using Rapid Radishes to help teach the concepts. 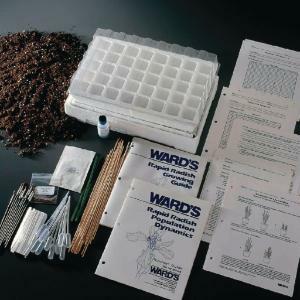 Comes with self-watering seed starter tray, Rapid Radish seeds, all necessary propagating materials, growing guide, teacher’s guide, and student copymaster. Students will observe the effects of plant interference as they grow Rapid Radishes in different population densities and under different environmental conditions. When the plants are grown, the students will compare the leaf indexes from each treatment to determine the interference that occurred under each condition. They will then use these results to help them understand the concepts of competition, parasitism, allelopathy, and crop rotation.